01056.17 (W) Sevier Co., UT, 7200ft, 2195m. 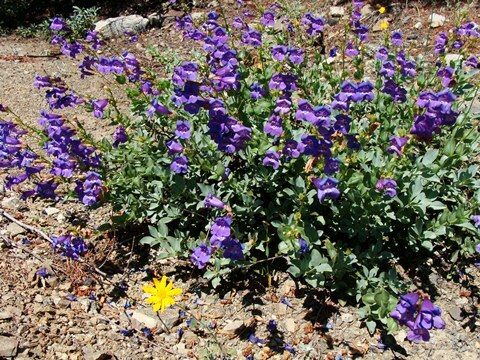 "Firleaf Penstemon." Decumbent stems are densely clothed in realistic, fir-like leaves. Ascending spikes of blue flowers with golden beards. Choice endemic. 19832.14 (W) San Juan Co., UT, 5000ft, 1524m. Lavender fls. in this population, growing in sand. Penstemon arenicola (Scrophulariaceae) (10x6,Z4,P,L,4:12w) .................................. 100 seeds / $4.00 07439.13 (W) Sublette Co., WY, 7000ft, 2135m. Densely-crowded verticillasters of the most intense blue. Waxy blue leaves. Growing in almost pure sand. Penstemon aridus (15x10,Z4,P,L,3:8w) ...................................................................... 100 seeds / $4.00 07455.93 (W) Meagher Co., MT, 7750ft, 2363m. Tufts of linear-spatulate leaves which eventually form mats. Blue-purple flowers on multiple stems. Growing on metamorphic volcanic screes. 08758.23 (W) Fremont Co., CO, 6200ft, 1890m. Large, deep lavender flowers with flamboyant gold beards over tufts of linear leaves. 08758.33 (W) Huerfano Co., CO, 6300ft, 1921m. Shorter form with lanceolate leaves. Lavender flowers. Penstemon barbatus v. torreyi (Scrophulariaceae) (120x25,Z5,P,C,3:8w) .................. 100 seeds / $3.00 10215.14 (W) San Miguel Co., NM, 5900ft, 1800m. Tall, lanky plants with stiff stems and multitudes of red flowers. Good for the back of the border. 10214.19 (W) Klickitat Co., WA, 250ft, 76m. From a crown arises myriad woody stems bearing leathery blue-gray glaucous leaves and spectacular racemes of rosy-lavender flowers shading to pale lavender. Penstemon brandegei (Scrophulariaceae) (45x18,Z5,P,L,3:8w) ........................................ 100 seeds / $3.50 10755.25 (W) Las Animas Co., CO, 6500ft, 1982m. 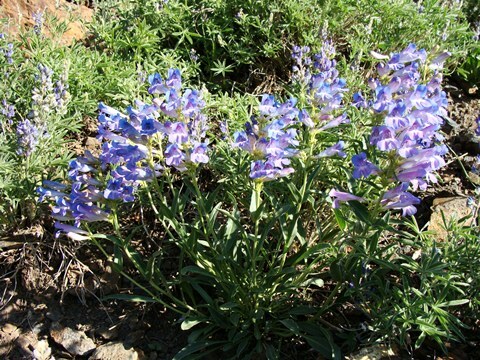 Robust form of Penstemon alpinus with dense spikes of large blue flowers. 10952.15 (W) Chaves Co., NM, 4100ft, 1250m. Lavender flowers in whorls around the massive stems. 12045.18 (W) Tulare Co., CA, 9000ft, 2744m. Nice mat-former with folded, blue-gray leaves and many short, open panicles of blue-purple flowers. Grows in the dappled shade of tall conifers. Penstemon caespitosus v. caespitosus (5x14,Z4,P,L,4:12w) ......................................... 100 seeds / $4.00 12041.46 (W) Gunnison Co., CO, 8600ft, 2622m. Small mats of creeping stems clothed in bluish-green, linear-spatulate leaves which smother themselves with blue, white-throated flowers in early summer. Treeless plains of sagebrush and volcanic rock. 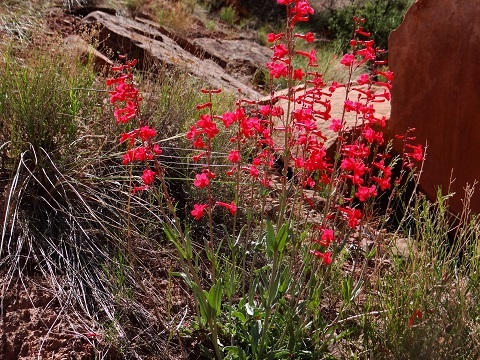 Penstemon cardinalis ssp. cardinalis (Scrophulariaceae) (50x28,Z6,P,L,3:8w) ................ 100 seeds / $3.00 12214.15 (W) Lincoln Co., NM, 7250ft, 2210m. 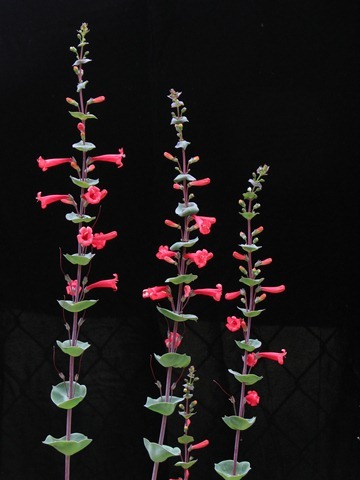 Spectacular racemes of red, tubular flowers with golden hairs protruding from the palate. The basal leaves are somewhat rounded, tapering to acuminate, clasping leaves farther up on the flowering part of the stem. From White Mtns of New Mexico. 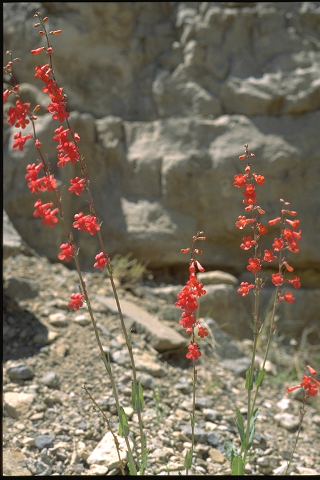 Penstemon cardinalis ssp. regalis (35x16,Z6,P,L,3:8w) ................................................ 100 seeds / $4.00 12221.25 (W) Eddy Co., NM, 4450ft, 1357m. A more refined and elegant version of P. cardinalis with wider leaves and somewhat dwarfer in stature. On N-facing walls of limestone. Penstemon cardwellii (Scrophulariaceae) (12x30,Z5,P,L,3:12w) .................................. 100 seeds / $4.00 12215.52 (W) Tillamook Co., OR, 3150ft, 960m. Bright green, toothed, oval leaves and violet to bright purple flowers on low growing, spreading plants intermediate in size between P. davidsonii and P. fruticosus. 12216.10 (W) Emery Co., UT, 7200ft, 2195m. Thick glaucous rosettes bear lavender-grape flowers. Penstemon caryi (Scrophulariaceae) (12x12,Z3,P,GL,4:12w) ........................................... 100 seeds / $4.00 12217.12 (W) Sheridan Co., WY, 9200ft, 2805m. Mats of slender, deep green leaves bear several short racemes packed with blue to blue-purple flowers. On a steep S-facing limestone slope. 12801.13 (W) San Juan Co., UT, 6900ft, 2102m. Pale blue flowers are widely spaced in whorls along the stems. The blue lobes shade to lavender in the throat with projecting anthers of white wool. Penstemon compactus (12x10,Z3,P,RGL,4:8w) ..................................................... 100 seeds / $4.00 12797.16 (W) Cache Co., UT, 9700ft, 2957m. A dwarf form of P. cyananthus with dense racemes of brilliant blue/violet in tight whorls on short ascending stems. On S-facing limestone cliffs. 13016.30 (W) Ada Co., ID, 3200ft, 975m. Panicles of blue, lavender or violet over narrow leaves. 12976.14 (W) Park Co., WY, 7200ft, 2195m. 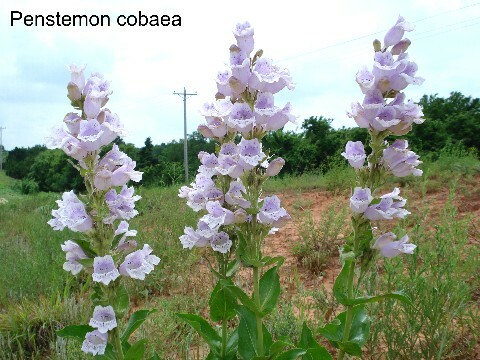 Broad, lanceolate, prominently-veined leaves support large, sky-blue flowers with a purplish throat. 12977.15 (W) Montrose Co., CO, 6000ft, 1829m. From large tufts of undulate leaves arise several stems packed with small blue-violet flowers. 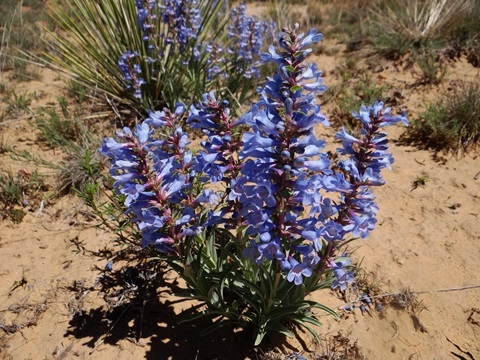 Grows in the sandy soils of the Colorado Plateau. 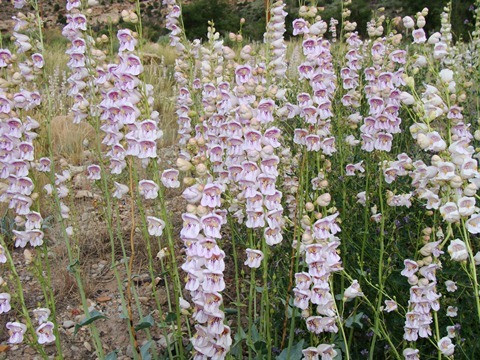 Penstemon digitalis (Scrophulariaceae) (70x35,Z4,P,L,3:8w) .......................................... 100 seeds / $3.00 15572.14 Panicles of pure white flowers from pink buds, the throat striated maroon. Glabrous foliage. Penstemon eatonii (Scrophulariaceae) (45x20,Z4,P,L,3:8w) ......................................... 100 seeds / $3.50 20800.25 (W) Iron Co., UT, 8800ft, 2683m. Bright scarlet bugles over glossy green foliage. This is the highest altitude population I’ve ever seen. On igneous scree. Penstemon eatonii v. undosus (55x24,Z5,P,L,3:8w) ......................................................... 60 seeds / $3.50 20802.28 (W) Grand Co., UT, 4275ft, 1303m. A robust form with undulate (wavy) leaf margins. 39454.20 (W) Boundary Co., ID, 5810ft, 1771m. Another beautiful member of the Subgenus Dasanthera with short, semi-secund inflorescences of light blue-purple flowers. The slightly-serrate, elliptical leaves are packed together fairly tightly. Growing on subalpine cliffs of basalt. Penstemon eriantherus (Scrophulariaceae) (15x10,Z4,P,C,4:16w) ................................... 100 seeds / $3.00 27454.38 (W) Park Co., WY, 8000ft, 2439m. Large lilac flowers and gray-green, pubescent foliage. 27457.10 (W) Chelan Co., WA, 3500ft, 1067m. Whorls of large violet flowers, several per stem. 29725.15 (W) Linn Co., OR, 3800ft, 1159m. 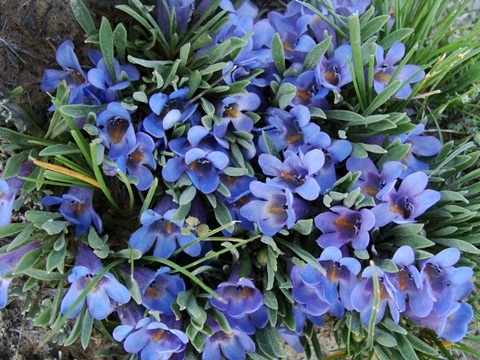 Loose mats of elliptical, glaucous leaves sprout numerous stems of interrupted whorls carrying lavender-blue flowers. On scoria under partial conifer shade. 30560.15 (W) Inyo Co., CA, 5700ft, 1737m. Multiple whips bear dentate blue leaves and baggy rosy-magenta flowers. Penstemon flowersii (12x8,Z5,P,L,3:12w) ............................................................... 100 seeds / $3.50 30561.41 (W) Duchesne Co., UT, 5250ft, 1600m. Leaves like P. carnosus but with sugar-pink flowers. 30754.15 (W) Iron Co., UT, 5425ft, 1654m. Tufts of narrow leaves bear glandular inflorescences crowded with blue flowers, the exserted staminodes yellow-bearded. Choice dwarf allied to P. nanus. 30756.23 (W) Uintah Co., UT, 7500ft, 2287m. Deep blue flowers are congested on several stems arising above finely-textured, cinereous-gray leaves. A great species from the Uintah Basin foothills. 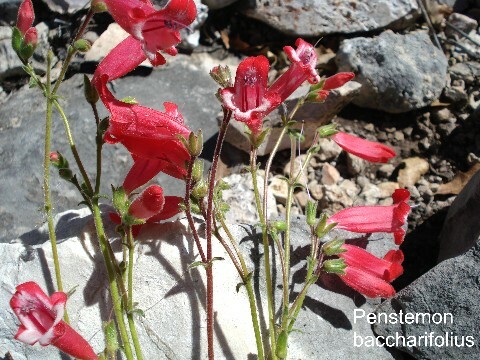 30762.08 The only Penstemon not native to the Americas. Ovate leaves clasp erect stems bearing tubular, pale purple, inch-long flowers in late summer. From Japan. 30763.15 (W) Inyo Co., CA, 3500ft, 1065m. Nearly cylindrical leaves and cream/pale pink flowers. 30764.15 (W) Deschutes Co., OR, 4900ft, 1494m. The thick, lance-shaped, serrated leaves are smaller than usual in this isolated population due perhaps to drier conditions. 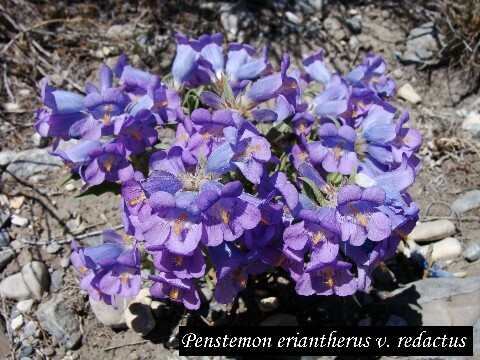 The large, open mats produce a thick forest of blue to violet-flowering racemes. 32554.13 (W) Park Co., CO, 9200ft, 2805m. 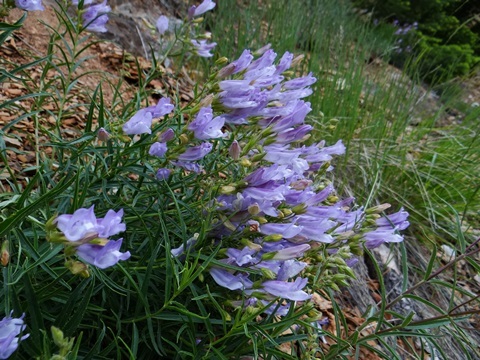 Gorgeous, deep blue flowers packed on several stems make their appearance over glossy green, obovate foliage in alpine meadows during the summer. 32555.10 (W) Washington Co., ID, 3200ft, 975m. Erect, glandular plants with serrated leaves support whorls of large lavender blossoms. 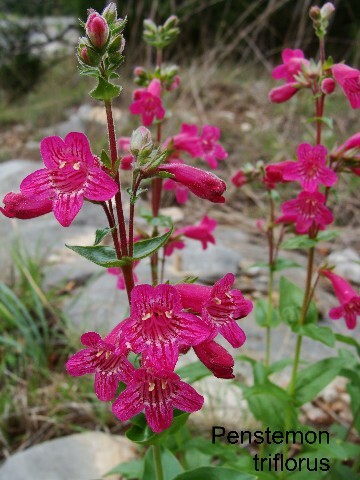 Penstemon grandiflorus (Scrophulariaceae) (60x18,Z4,P,C,3:8w) ...................................... 90 seeds / $3.00 32757.44 Wide, deep pink blossoms over fleshy, gray-green leaves. Imposing magnificence. 32758.18 (W) Ventura Co., CA, 5600ft, 1707m. Glaucous blue-green leaves and pale pink flowers. Penstemon hallii (Scrophulariaceae) (8x12,Z3,P,L,1) ................................................. 100 seeds / $4.00 35194.13 (W) Park Co., CO, 12100ft, 3689m. Tufts of linear foliage with clumps of violet-blue dragons hovering on short stems. Classic miniature alpine easily grown. 35995.28 (W) Butte Co., ID, 6000ft, 1829m. Robust form here with tufts of gray-green, oblong leaves and several spires densely-packed with small blue flowers. 35996.23 (W) Salt Lake Co., UT, 9850ft, 3003m. Rosettes of green, spatulate leaves form compact mats bearing deep blue, glandular flowers in congested whorls. On S- and W-facing granitic screes. 59812.10 (W) Inyo Co., CA, 5100ft, 1555m. Thick, linear leaves and baggy blue flowers. 54043.14 (W) Kane Co., UT, 5750ft, 1753m. Smooth, bright green leaves and secund racemes of blue-purple flowers. 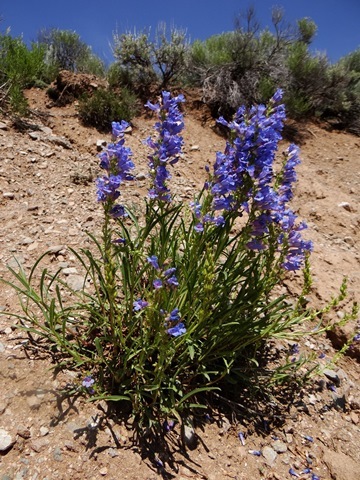 Growing in deep sandy soils of the white Navajo formation. 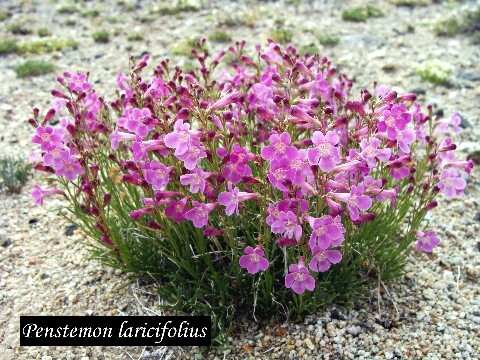 Penstemon laricifolius ssp. exilifolius (9x8,Z3,P,GL,4:12w) .......................................... 100 seeds / $4.00 54214.24 (W) Albany Co., WY, 7200ft, 2195m. Dwarf, grassy tufts with glistening white flowers. This population is a bit dwarfer than the pink-flowered plants. Great for troughs. 54396.38 (W) Lemhi Co., ID, 7500ft, 2286m. Bold plants like P. cyaneus, but shorter with narrow, glaucous leaves and large, deep-blue flowers. On N-facing rocky loam with sagebrush. Penstemon leonardii (9x25,Z3,P,GL,3:12w) ............................................................ 100 seeds / $4.00 54279.16 (W) Cache Co., UT, 9800ft, 2988m. From a central woody crown sprout a dozen or two lax but ascending stems bearing myriad deep blue flowers in narrow panicles. 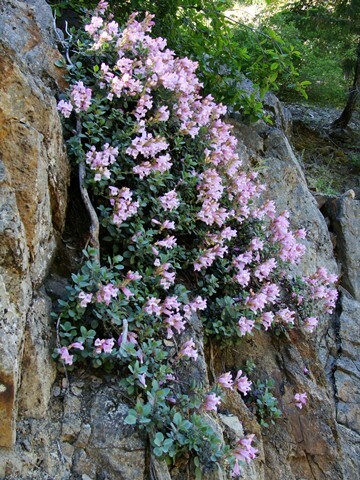 An uncommon, choice, dwarf shrubby type growing on broken limestone slopes. 54599.11 (W) Coconino Co., AZ, 7000ft, 2134m. The narrow green to blue-green leaves densely clothe short arching stems and bear hundreds of blue to lavender, pale-throated, veined flowers. 54600.15 (W) Washington Co., UT, 6100ft, 1860m. Linear leaves and decumbent spikes of blue flowers. Penstemon mensarum (50x20,Z4,P,RL,3:8w) .................................................................. 100 seeds / $3.50 56398.21 (W) Mesa Co., CO, 10300ft, 3140m. Rich, royal, cobalt blue flowers on multiple racemes. 56770.14 (W) Mesa Co., CO, 5200ft, 1585m. 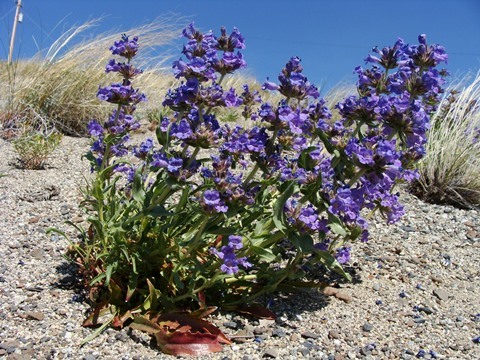 Wavy, sage-green leaves and deep purple-blue flowers. 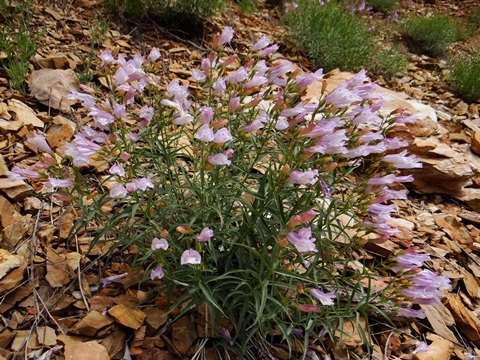 Penstemon montanus ssp. idahoensis (15x24,Z3,P,GL,3:8w) ..................................... 100 seeds / $4.50 56799.13 (W) Valley Co., ID, 7900ft, 2408m. The leaves range from green-blue to icy-blue, and are generally hairy. Large lavender flowers in dense spikes. Exquisite. Endemic to central Idaho. Penstemon nanus (2x4,Z5,P,GL,4:12w) ............................................................................ 60 seeds / $5.00 58198.18 (W) Millard Co., UT, 5700ft, 1738m. One of the best miniatures of the genus with small gray leaves and blue flower clusters. Native to dry limestone slopes. Penstemon neomexicanus (60x18,Z5,P,C,3:8w) .............................................................. 100 seeds / $3.00 58279.25 (W) Otero Co., NM, 8600ft, 2622m. Glabrous, leathery basal rosettes, racemes of blue. Penstemon nitidus (12x10,Z4,P,RGL,3:8w) ................................................................... 100 seeds / $3.50 58618.14 (W) Jefferson Co., MT, 6300ft, 1920m. The typical form here with sky blue flowers and glaucous blue leaves. Growing in fine granite soil. 81678.17 (W) Garfield Co., CO, 8200ft, 2500m. 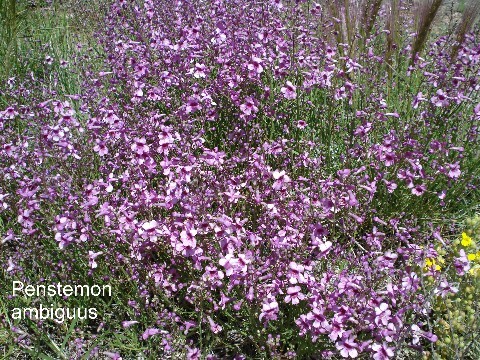 Very thick, glaucous leaves like P. utahensis with usually a single stem bearing lavender-blue to purple flowers. 69021.04 A showy species with oval, toothed leaves and an open inflorescence of many deep blue flowers. 70152.17 (W) Sevier Co., UT, 7100ft, 2165m. Thick, gray-green leaves, intense blue-violet spikes. Penstemon palmeri (90x26,Z4,P,L,3:8w) ....................................................................... 100 seeds / $3.50 70194.38 (W) Iron Co., UT, 7800ft, 2378m. Slightly smaller than normal plants here probably only due to the higher elevation. Mature plants will produce multiple spires loaded with huge, pink, fragrant blossoms. Glaucous, toothed leaves. 70195.14 (W) Kane Co., UT, 6200ft, 1890m. 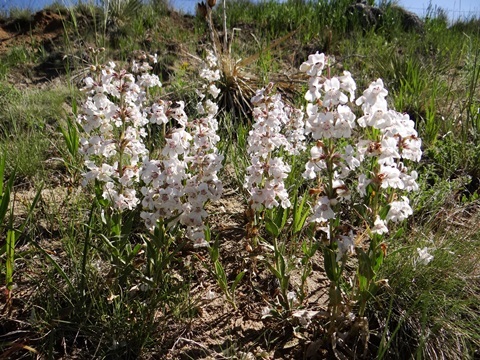 A glabrous population here with pale pink to white flowers. 70215.50 (W) Jackson Co., OR, 5800ft, 1768m. Glaucous leaves with dense blue-lavender racemes. 70218.18 (W) Inyo Co., CA, 7400ft, 2256m. Blue-gray mounds sprout lavender to violet panicles. 70111.34 (W) Adams Co., ID, 3200ft, 975m. Brilliant blue flowers and leathery, rich green leaves. Penstemon pinifolius (22x36,Z5,P,L,4:8w) ..................................................................... 100 seeds / $3.50 70598.04 Cult. Criss-crossing, lax racemes bearing myriad red-orange flowers on diminuitive shrublets. 70554.19 (W) Salt Lake Co., UT, 6500ft, 1982m. A forest of stems lined with elliptical leaves arise from a branched rootstalk and bear myriads of lavender flowers for several weeks. 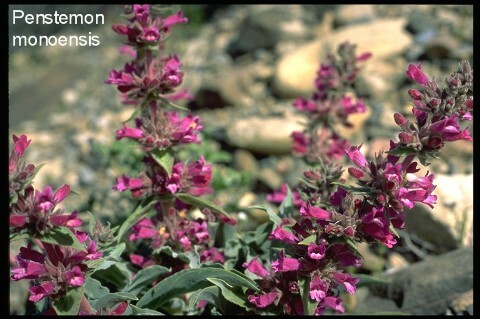 Wasatch Mtns endemic. 70762.15 (W) Linn Co., OR, 5400ft, 1646m. Whorls of small deep blue flowers on numerous stems. 70763.15 (W) Siskiyou Co., CA, 8900ft, 2713m. Thick dark green leaves are packed into short rosettes which create mats over a foot across or more. Dense heads of deep blue-violet. Volcanic screes. Penstemon procumbens (10x30,Z3,P,L,4:12w) ............................................................... 75 seeds / $3.50 70760.44 (W) Gunnison Co., CO, 9800ft, 2990m. (= P. crandallii v. procumbens.) Endemic to the mountains around Crested Butte is this woody, decumbent creeper with small rounded leaves and blue flowers. Penstemon pseudospectabilis (Scrophulariaceae) (70x30,Z5,P,L,4:8w) ................ 100 seeds / $3.50 70776.26 (W) Yavapai Co., AZ, 3820ft, 1165m. Multi-stemmed plants with clasping, oblong, toothed saucer-leaves and bright rose-red to pink flowers. Superb for dry gardens. 74196.13 (W) Saguache Co., CO, 10000ft, 3048m. Linear, thread-like leaves in interrupted whorls along the numerous stems bear blue flowers on the upper half. An obscure, unusual species delivering a misty effect in the garden. Recently lumped under P. crandallii v. glabrescens. 74418.15 (W) Montrose Co., CO, 6000ft, 1830m. Silver-green tufts produce short erect spikes of deep blue. Superb endemic of western Colorado worth every effort to cultivate. 74553.16 (W) Wheeler Co., OR, 2500ft, 762m. Sprays of bright lilac-pink on dwarfer plants. 74643.14 (W) Plumas Co., CA, 5800ft, 1768m. (= P. laetus ssp. roezlii.) Numerous decumbent stems with long gray-green leaves arise from a woody rootstalk. Racemes of deep blue-purple flowers. 74816.45 (W) Tulare Co., CA, 6100ft, 1860m. Reddish-orange flowers with creamy-yellow throats. This collection from an exceptionally dry site in the southern Sierra Nevada Mountains. Penstemon rupicola (7x26,Z4,P,L,3:8w) ...................................................................... 100 seeds / $4.50 75010.73 (W) Yakima Co., WA, 5450ft, 1662m. A superb form with deep rosy-magenta flowers over gray-blue foliage. On volcanic cliffs and scoria. Penstemon scariosus v. garrettii (14x12,Z4,P,GL,4:8w) ............................................. 90 seeds / $3.50 76134.16 (W) Uintah Co., UT, 7600ft, 2317m. Beautiful sky-blue flowers shading to a violet throat project from several verticillasters above clumps of linear-spatulate foliage. In red sandy clay soil. Penstemon secundiflorus (35x10,Z4,P,L,3:8w) ......................................................... 100 seeds / $3.50 76352.38 (W) Jefferson Co., CO, 6050ft, 1845m. Beautiful, luminescent, lavender-pink blossoms in late spring. Sleek, glaucous blue foliage. Penstemon serrulatus (26x24,Z5,P,L,3:8w) ............................................................... 100 seeds / $3.50 76414.23 (W) Yakima Co., WA, 5450ft, 1662m. Clusters of reddish-purple flowers on multiple stems lined with serrated leaves. 76720.25 (W) Washoe Co., NV, 8900ft, 2713m. A striking dwarf form with blue-gray rosettes and multiple clusters of large, white-throated, deep blue flowers. In fine granitic scree, facing south. 76730.20 (W) San Diego Co., CA, 5100ft, 1555m. Bicolor flowers of blue/pale lavender with white throat. Toothed leaves fused around the stems. 76801.15 (W) Iron Co., UT, 9000ft, 2744m. Multiple spires of scintillating blue-purple in summer. 77010.00 Spectacular vivid coral-red flowers line tall spires. Penstemon tiehmii (Scrophulariaceae) (12x12,Z4,P,L,3:12w) ..................................... 60 seeds / $6.00 78437.11 (W) Lander Co., NV, 8600ft, 2622m. 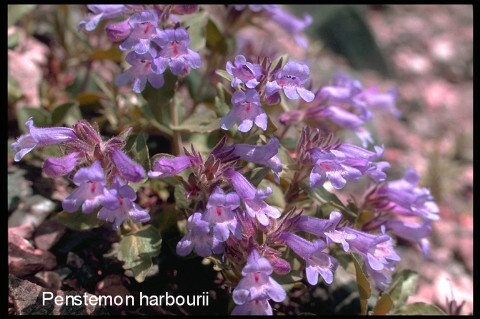 Probably new to cultivation is this dwarf, subalpine penstemon with gray-green leaves lying flat on the ground bearing a thyrse of small violet flowers. Growing on south-facing cliffs and screes of dense volcanic rock. 78758.27 (W) Kerr Co., TX, 2200ft, 671m. In addition to the usual deep pink flowers, there were some nice pale pink forms in this population. Growing on limestone embankments. 79016.14 (W) Beaver Co., UT, 8300ft, 2530m. (= P. caespitosus v. suffruticosus.) Prostrate, bonsai-like plants with blue-gray, tiny round leaves edged in maroon bear violet-blue flowers. Beautiful species. 90398.38 (W) Caribou Co., ID, 6750ft, 2058m. Multiple stems from a woody crown bear serrated leaves and bright lavender-purple flowers in narrow terminal panicles. 90414.47 (W) Fremont Co., CO, 5150ft, 1570m. Essentially a blue-purple form of P. secundiflorus. Glaucous blue leaves, slightly wavy. 90614.17 (W) Elbert Co., CO, 6650ft, 2027m. Mats of glossy, deep green, spatulate leaves sprout numerous spikes bearing deep blue flowers. No pink forms here on the Plains, just the occasional albino. 90614.43 (W) Grand Co., CO, 8400ft, 2561m. Mats of glossy, deep green leaves sprout numerous spikes bearing deep blue flowers covered with glandular hairs. 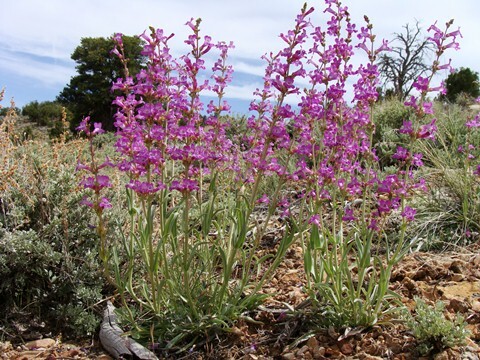 This population is unusual in that about 4% of the plants had clear pink flowers. 92214.17 (W) Sevier Co., UT, 6800ft, 2073m. Large fls of clear violet-blue over pubescent tufts. 92216.17 (W) Chelan Co., WA, 6200ft, 1890m. Deep blue, tubular flowers in several interrupted whorls. 92218.16 (W) Lander Co., NV, 8600ft, 2622m. A rather tall member of Sect. Proceri with small, tubular, deep-blue flowers packed into dense whorls. There are several whorls spaced along each of the 20 to 30 stems, accompanied by prominent lanceolate leaves. A rarely-seen, unusual species.